Hard Cover, 192 pages, 8x10. A beer and food revolution is under way in Britain and award-winning food writer Fiona Beckett and her publican son, Will, have joined forces to write the first cookbook to explore this exciting new food phenomenon that celebrates beer as a culinary tour de force. This collection of more than 100 simple and approachable recipes has been specially created to show the versatility and fantastic flavour that ale has to offer. With sections on Snacks, Spreads and Dips, Soups, Pasta and Risotto, Seafood, Chicken and other Birds, Meat Feasts, Spicy Foods, Bread and Cheese and Sweet Treats it provides countless ideas for using beer from around the world. With an open mind, a bottle opener and a well-stocked larder, this exciting book will allow you to enjoy real food, real beer and real flavour. 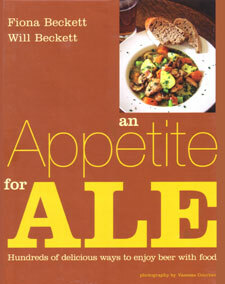 » See more books by CAMRA.